General Leslie Groves and J. Robert Oppenheimer were a study in contrasts, yet both were indispensable to the success of the Manhattan Project. Both men were extremely ambitious and overcame personal differences to achieve their common purpose. A West Point graduate, General Leslie Groves was chosen to head the Manhattan Project for the Army Corps of Engineers in September 1942. Prior to his assignment, Groves was in charge of all domestic Army construction during the mobilization period for World War II. The projects included the building of camps, depots, air bases, munitions plants, hospitals, airplane plants, and the Pentagon. Groves oversaw a million men and spent $8 billion on Army construction with a peak month in July 1942 of $720 million, the equivalent of fifteen Pentagons. Groves' proven record of managing complex undertakings made him a logical choice to lead the Manhattan Project. At the time of Groves' appointment, J. Robert Oppenheimer was already considered an exceptional theoretical physicist and held teaching positions at the University of California at Berkeley, and the California Institute of Technology. By the fall of 1942 he was deeply involved in exploring the possibility of an atomic bomb. Throughout the previous year he had been doing research on fast neutrons, calculating how much material might be needed for a bomb and how efficient it might be. In May 1942 Arthur H. Compton chose Oppenheimer to head the theoretical group exploring these questions. Oppenheimer convened a summer study conference at Berkeley in July to assess where the research stood. Many members of this "galaxy of luminaries" would soon be recruited to go to Los Alamos and other Manhattan Project sites. "Oppenheimer had two major disadvantages—he had had almost no administrative experience of any kind, and he was not a Nobel Prize winner," wrote Groves in his memoir Now It Can Be Told: The Story of the Manhattan Project. However, the Military Policy Committee in charge of the selection could not produce a better candidate, and Groves made the astute decision to designate Oppenheimer as director of the Los Alamos Laboratory. Another of Oppenheimer's flaws was his troublesome past associations with Communist causes, which Groves ultimately disregarded despite the concerns of some members of the committee. "I have never felt that it was a mistake to have selected and cleared Oppenheimer for his wartime post. He accomplished his assigned mission and he did it well," continued Groves, writing after Oppenheimer's security clearance had been revoked in 1954. Despite their differences in style, Groves and Oppenheimer became an effective pair. 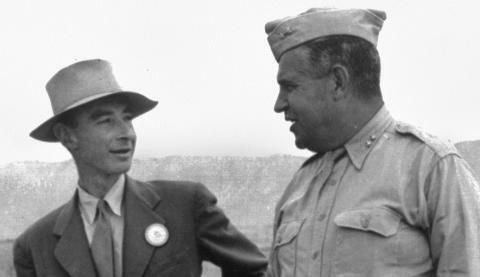 For more information, our "Voices of the Manhattan Project" website features interviews with General Groves and Oppenheimer. The Atomic Heritage Foundation produced a documentary film on the life and work of General Leslie Groves. To purchase the film, visit our online store. Cynthia C. Kelly, Oppenheimer and The Manhattan Project: Insights Into J Robert Oppenheimer, "Father Of The Atomic Bomb"